This is a short video from H.E. Avikrita Rinpoche on the Art of Keeping Cool. Now we are entering the ‘year of the bird’ but let’s make sure it’s not a year of the angry bird! We need the Buddhist Art of Keeping Cool to empower clarity of mind and strength of heart, and thereby bring about a truly auspicious Year of the Fire Rooster. A special teaching on the Joy of Giving by our Head Lama, H.E. Khöndung Avikrita Sakya Rinpoche This timely teaching is thoughtful, humorous, and beneficial to all community members. Many young monks from the Sakya Heritage Foundation in India are also featured in a charming skit section of the teaching! H.E. Avikrita Vajra Rinpoche presents a sequel to his video on the 7 Point Posture that focuses on the Nine Stages of Mind Abiding as an introduction to Buddhist meditation practice aimed for young practitioners. Instruction on how to sit for meditation by H.E. 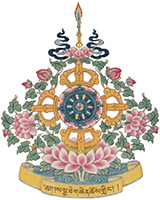 Avikrita Vajra Rinpoche. Both informative and fun! Video: How Can I Get One Pointed Meditation? H.E. Avikrita Vajra Rinpoche answers a student’s question about meditation with insight and humor.